This is a game for fanatical followers of soccer who have a driving ambition to manage their own team. FM is the standard management soccer game. Pick your team, study form, check the league positions, - its all there as you become Cloughie for an afternoon. Highly recommended. [Budget Re-test] FM is the standard management soccer game. Pick your team, study form, check the league positions, - its all there as you become Cloughie for an afternoon. Highly recommended. Ich habe das Spiel FOOTBALL MANAGER (Spectrum-Version) schon seit einiger Zeit und muß sagen, es ist wohl eines der intelligentesten und spannendsten Strategie-Programme, die ich je gesehen habe. Es macht einfach Spaß, sein persönliches Team zur Meisterschaft zu führen. Ich meine, dieser Oldie ist ein Dauer-Hit! 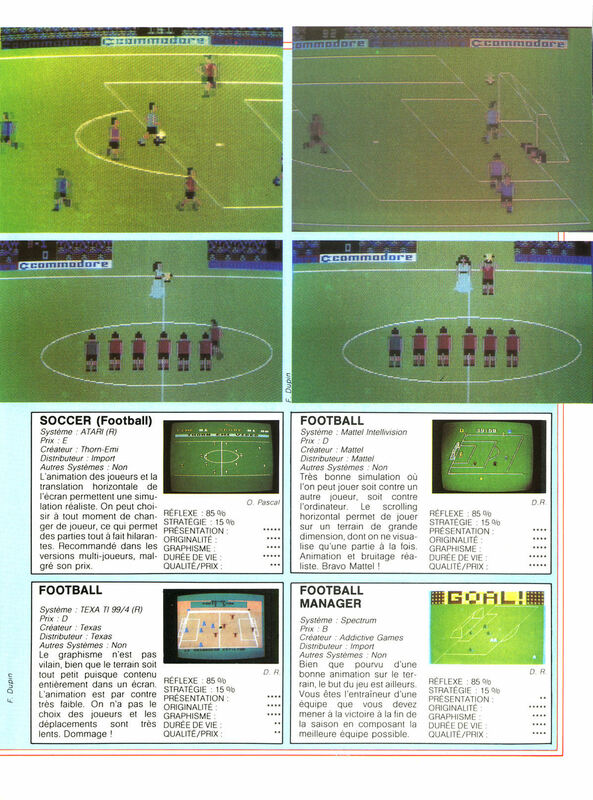 The first, and some would say still the best football management game. It's the game that made its designer - 6-foot-plus giant Kevin Toms - a part of computer game history, as his bearded mug shot appeared on all of the hundreds of thousands of games that were sold. Quite a photo star was 'Our Kev'. I found Football Manager totally absorbing. Playing on the lowest of seven skill levels, I managed to gain promotion from the Fourth Division and won the FA Cup in the same year. A bid for the First Division championship could take several days. If you fancy yourself as Brian Clough or Terry Venables, get yourself a copy of Addictive's Football Manager - it's better than the real thing! For those who do not realise this often took 10 minutes or more depending on where the save was. For the more ambitious and conniving player you could quite easily hack into the code and alter things to your favour but why bother if that was the case? The game did have it's problems, among which was the fact that on a regular basis your team might only consist of 9 players due to injury. Funny thing is, you often won those matches! Unlike management games today or subsequent sequels the game was very much luck and not skill. No single formation, tactic or team could guarantee success and to this day Gamestyle remains convinced it was programmed to cheat anyway! Classic stuff. Es ließe sich sicherlich noch einiges über den Football Manager sagen (ich denke, man merkt, daß es mir nur schwer gelingt, meine Begeisterung für dieses phantastische Programm zu unterdrücken), doch das eigentlich Wichtige ist die Fülle von Möglichkeiten und Varianten, die dieses Spiel bietet. Zudem íst es dem Addictive-Team gelungen, ein Programm zu entwickeln, das – wie kaum ein anderes – Spiele-Freaks und Sportfreunde gleichermaßen anspricht. Für mich ist und bleibt der Football Manager eines der besten Sportspiele, die jemals veröffentlicht wurden! Though crucial to the football videogame timeline, it's difficult to recommend this title for much beyond historical study. Admittedly it can be relief to play a management game which doesn't force you into clicking on a desk tidy to set up the hoovering schedule for your club's cleaning staff, and moaning at the ineptitude of the stick-figure players is entertaining for a while, but that's where interest begins to wane. Eight points for kicking off the genre, but the march of time has sadly doomed this veteran squad to relegation. Bien que pourvu d'une bonne animation sur le terrain, le but du jeu est ailleurs. Vous êtes l'entraîneur d'une équipe que vous devez mener à la victoire à la fin de la saison en composant la meilleure équipe possible. Overall, a fair conversion but let's face it, it's a game of two halves and I've got a feeling Gremlin's new footy game, might come through to steal a win. Back to the studio and the rest of the day's results. [Budget re-release] A classic strategy game, it's still massively addictive today, though it's been out-featured by practically every other game in the genre since. This Amiga version, sadly, isn't half as good as even the Spectrum one. The match highlights - the game's centre-piece, are unbelievably slow and tedious, and without their hook the gameplay is left looking as slight as it actually is. Dig out your old 8-bit and play it on that instead.